We are starting the final and fourth week of Blogging Marathon today. I am going to do Sandwich without Bread. This was one of the themes that came about when we were flying out to Ahmedabad for our 25th Edition celebrations. Can’t believe it’s more than a month now since we all met and had the best time of our life. Since Kamalika and I had our tickets booked together, we travelled together, while rest, unfortunately, had to sit in different places. We both had so much fun, teasing and pulling everything we could think of. Then naturally the topic steered to BM Themes and Kamalika was suggesting some very interesting ones. One of the things we thought would be fun to do, was this Sandwiches made without Bread. The requirement was something should be stuffed and served between two layers. When I thought about it, I basically thought of already cooked and assembled to serve as a sandwich. So I tried my best to stay true to what I had in mind. I had been thinking of different combinations and ideas, some wouldn’t just go away. So I made sure I tweaked with the ideas I got and came about some really delicious dishes that everybody loved at home. 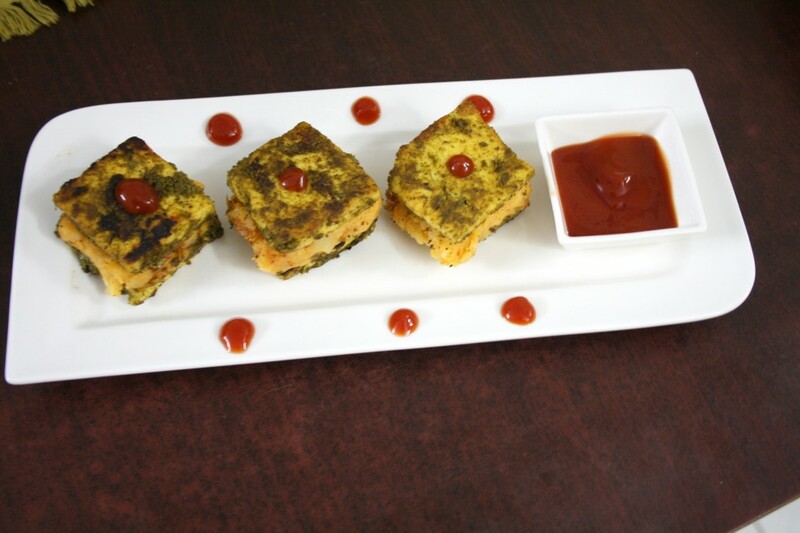 Coming to the Hariyali Paneer Tikka, I used to make these so often during my college days. As I said I was more into baking, and cooking exotic dishes, which surely included this. I say this was exotic as we were introduced to Paneer only during that season. So any cooking with it was considered very special. So frequently it used to appear on our table in the form of this low calorie Hariyali Tikkas. I call this low cal, as it hardly consumes oil. Also, I used to follow the Tandoor less style, yet making it smoked. I also remember using some Veg masala cubes that were available in the market during that period. I am not sure if those cubes are available now, however, I went ahead making without it, this time. I went ahead making this, went out alerting everybody that they are going to get new snacks. Everybody loved it and Daddy remembered those Hariyali Paneer Tikkas that I was making years back! The soft, yet crunchy pieces of aloo with cheese, that got stuck on the pan, gave a delightful taste to the stuffing inside. When Konda walked into to check out what I was making, she wanted to know where my inspiration was. I was glad to tell her that this was entirely my own and she was so happy to know. This will surely be a hit when you serve this as a party starter. PS: a couple of pictures are out of focus, I changed my P&S and still struggling with it. Hubby dear suggested I use my DSLR for the step by step as well. Well, that’s no way I can manage, the constant washing and wiping the hands is already so tiresome. Wash and chop the leaves, grind with the green chillies to a smooth paste. Cut the paneer into 2 inch squares, making sure it’s also thick in width. In a bowl, transfer the curds, the ground paste, roasted cumin powder, chat powder, salt to taste. Mix everything well. Add the paneer pieces and marinate for at least 10 – 15 mins. Heat a nonstick pan, grease with oil. Cook the paneer pieces till all the moisture evaporates and the paneer is cooked on both sides. You will have to sprinkle oil in between to make sure the tikka gets golden brown on both sides. MW the potato for 4 – 5 mins, after slashing with a knife on the outer. Soak and peel. In a bowl, grate the cheese, add the mashed potatoes, chilli powder and salt. Mix and make small balls. Pat them into 2 inch discs. 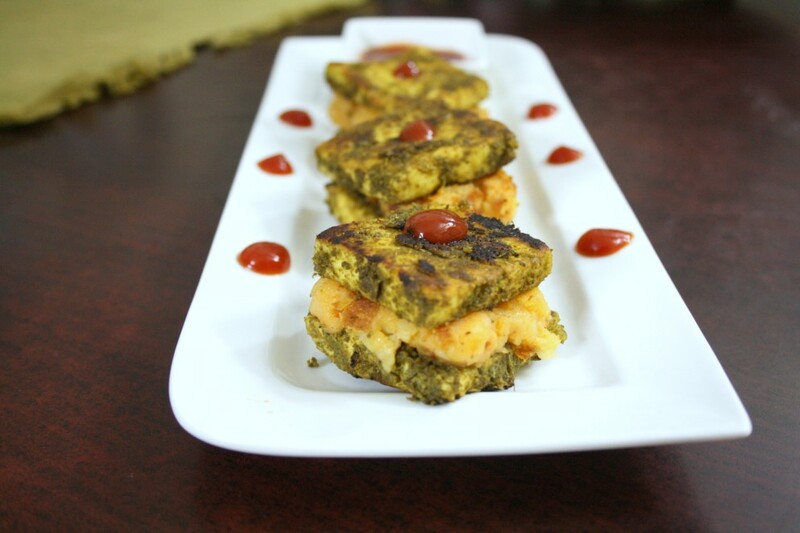 Heat a nonstick pan, grease with oil and cook the aloo cakes on both sides. Simmer and remove after 5 -6 mins. Since I didn’t add any binding ingredient or outer coating, the cakes tend to get stuck to the pan. Also since this is just potato and cheese, it will not be firm when it’s getting cooked. It is enough if you cook for 5 mins for the cheese to melt. You will end up getting a soft mass, so just transfer to a plate and allow it to cool down. Once it cools down, pat it to form a square and cut into pieces that will fit the paneer. Make sure you scrape out the bits that get stuck to the pan. The crunchy pieces give a great taste and texture to the stuffing in between. How to assemble both the Tikkas with Stuffing together. Transfer to a serving plate. Place one aloo cake on the top, top it with another Tikka and press down firmly. perfect party dish!!! so cute sandwich!!! beautifully made sandwich. The paneer looks so juicy & the potato looks crunchy from out & tender inside. Yumm! 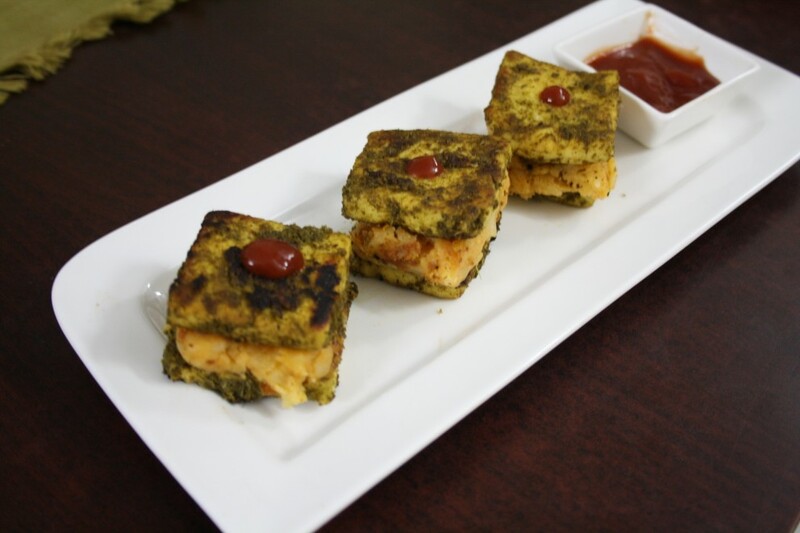 first few pics look awesome .. loved the plating too Valli..
That is an awesome idea..definitely a paneer lover's delight! Kamalika always comes with fantastic themes na Valli, even i always awestuck to see the themes she hosts for. Those paneer tikkas with cheese and potato cake,oh god just calling me to pick and eat. The dish is totally new and healthy . it is a great starter as well as good as a kids snack too. Loved the innovation a lot….Your dish is surely an all rounder….. Cool idea. Love that color. Awesome theme it is. what a fabulous and innovative recipe! Cant believe its more than a month since we all met Valli!! The masala cubes are still available in the market, Valli. You have cme up with a mouthwatering recipe (as always!) and its great that the theme idea came up when you were so high in the sky! Valli, those look AWESOME. So healthy with lots of flavor. Love that vibrant green color. Perfect and justice to the theme. This is a brilliant idea Valli!! Oh wow!! 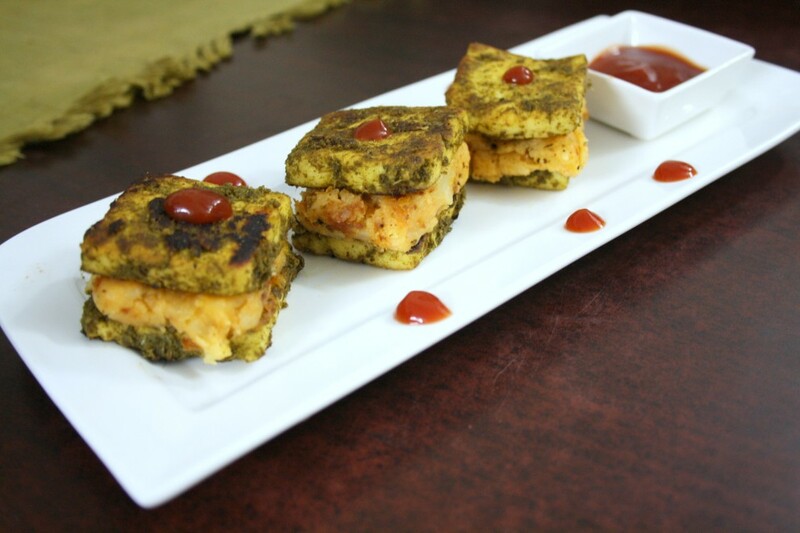 !Paneer recipe again…love this…bookmarked! !